Hi, it's Libeeti here! Did you all had a lovely Thanksgiving day? Even though I'm not an American and I don't celebrate this holiday, I'm thankful for so many things, and I try to stop from time to time to give thanks. 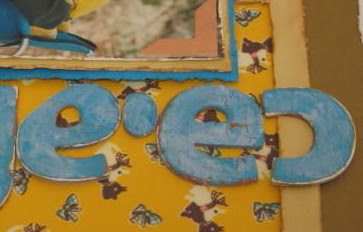 Anyway, today I want to share with you a little trick, how to make those crackled chipboard alphabets. Acrylic paints - in two contrasting colors. You'll need to decide which of the colors you wish to be on surface and which one will be the 'crackled' one, to reveal from underneath. Carpenters' wood glue (I used Elmer's). Paint you alphabets chipboards with the first color (the one to show out from the cracks). Let it dry completely. Spread the carpenters' wood glue on the painted chipboards. Let it dry completely. Paint the dried alphabets with the second color. Make sure you're painting on the same direction you spread the carpenters' wood glue, so the cracks will show better (I forgot, and that's why my blue alphabets aren't the best. but look at the cream ones, they're much better!). Did I already mention you need to let it dry completely? Well, please do so.... (yea, I forgot to write down "patience" in the ingredients list...). Now you can see the cracks starting to appear! (I added some white acrylic paint, to give a cloudy look, but it's not necessary). So how about giving it a try? We'd love to see it, so if you do use this technique, please live us a comment with a link to your creation, so we'll be able to pop over and leave you some love! What a great tutorial, Libeeti!! Hugs!! Great tutorial! I am going to have to try this! 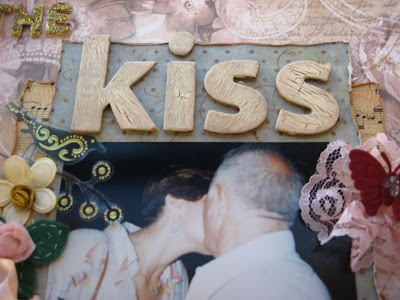 I don't use a lot of chipboard letters because I never have what I need but this might be a way to spark my interest! Libeeti... I am so glad you shared this little trick with us!! I will be using it for sure!